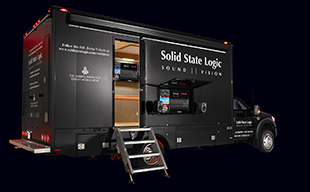 OXFORD, UK  Solid State Logic, the worlds leading manufacturer of analogue and digital audio consoles and provider of creative tools for music, broadcast and post production professionals, is pleased to announce a surging demand for its hugely popular C Series digital consoles. In particular, the rapid pace of installations has continued through the acclaimed C100 Digital Broadcast Consoles recent evolution to the C100 HD and C100 HD-S, along with the addition of Version 4.0 software and the Centuri HD-S processor. Recent sales and installations of the C100 HD include VERSUS, the national cable outlet of the National Hockey League as well as collegiate sports and best-in-class events like the Tour de France, the Americas Cup, the Boston Marathon and Davis Cup. VERSUS is currently installing a C124 HD console at its new Stamford, Connecticut-based studio facility. WETA, the leading public broadcasting station based in Washington DC, recently installed a C132 HD with SSLs MORSE (Modular Resource Sharing Engine) system to achieve the upcoming transition to HD broadcast of the prestigious NewsHour with Jim Lehrer. Also in the public broadcasting realm, WGBH, the Boston-based producer of more PBS primetime programming than any other station, has installed a C200 Digital Production Console for WGBH Radio. The C224 will anchor the control room of WGBH 89.7s new, 1,800 square-foot performance studio. Iowa Public Television, Iowas statewide public broadcasting network, has ordered two C100 HD consoles. The installation of a C140/32 HD and C124 HD will incorporate the MORSE system, interconnecting IPTVs auditorium theatre and main production control rooms. Systems designer and integrator TV Magic is facilitating IPTVs C100 HD installations. TV Magic is also handling a C100 HD installation at Trinity Broadcast Networks recently-constructed New York City broadcast facility. Trinity Broadcast Network (TBN), the leading producer of original Christian programming, has acquired a C148HD for its new facility. Most recently, Great American Country, the exclusive television home to the Grand Ole Opry and leading broadcaster of country music videos, performances, live concerts and original programming, has ordered a C132/24 HD for its Nashville-based production facilities. Madison Square Garden (MSG) Network, the metropolitan New York regions top sports broadcaster, is installing a C140/32 HD in its studio located inside the famed arena.